Priced at $80, the Honeywell Lyric Wi-Fi Leak and Water Freeze Detector is a nifty device that pings your smartphone as soon as a leak is detected at your home, or when the temperature drops below a certain level. Part of the Honeywell Lyric family, it’s designed to integrate neatly with other Honeywell smart home devices, like the Lyric T5 Wi-Fi Thermostat we recently reviewed. 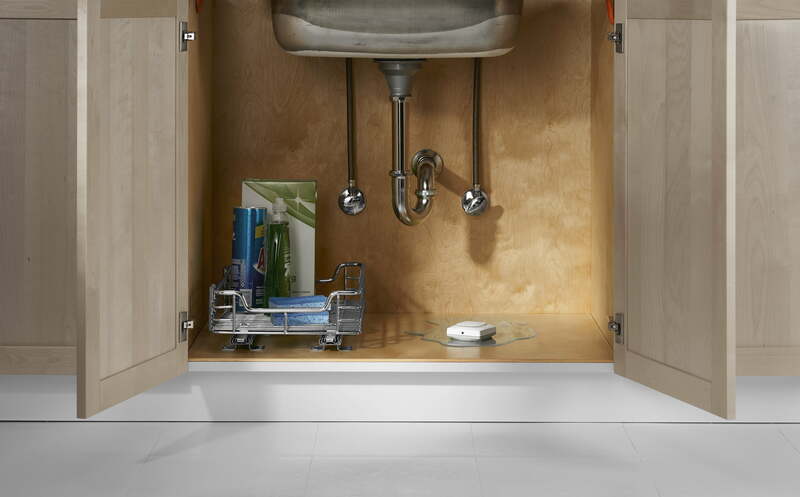 While it’s the perfect accessory for smart homes that experience regular flooding, it’ll provide peace of mind for any homeowner worried about the prospect of frozen pipes or water damage near washing machines, heaters or sinks. The 3.1″-square, battery-powered (3 x AA supplied) detector isn’t going to win any design awards – nor does it need to – but it’s solidly-built with a grippy base that should prevent it from sliding around once installed. It’s equipped with an optional 4-foot cable sensor that trails on the floor, plus a screw for fixing the detector to a wall or baseboard. A flexible design allows the device to work in a wide variety of locations. You can choose to place the detector on the floor without using the sensor or daisy-chain multiple cable sensors ($20 each) to protect a large floor area. As you’d expect, installation is simple. Install the batteries, hook up to the Lyric smartphone app (iOS and Android supported) and place the detector/cable sensor on the floor. That’s it. The device initially pairs to your phone over Bluetooth before being handed over to your home network, so be sure you have Wi-Fi service available if you’re targeting a basement installation. 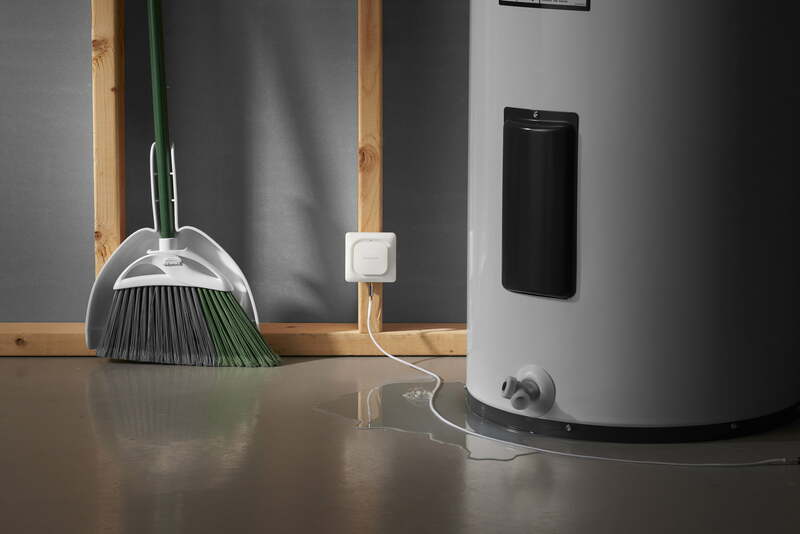 A test with both the detector and sensor cable proved the Honeywell Lyric to be quick to identify water leakage, firing an audible alarm, email alert and push notification to a smartphone. We felt the alarm could have been a little louder, but the email and push notification really helped to reinforce the alert. You can even mute the alarm directly from the app, adding convenience. The Lyric app itself is a pleasure to use. You’re able to define internal temperature and humidity alert ranges, choose the type of alerts you wish to receive, and configure additional email addresses for alerts, making it easy to add nearby family members, friends and neighbors when you head off on vacation. If you’re concerned about battery life, the detector mostly operates in a dormant state, waking up to three times per day (or less, depending on your preferences) to send out a status report. A daily report supports an estimated three-year battery life, while reporting twice or three times a day drops that to two or one-year, respectively. It means that the Lyric detector can take up to a minute to sense a leak, but we found that alerts fired in less than ten seconds. Overall, the Honeywell Lyric Wi-Fi Leak and Water Freeze Detector is a smart but simple addition to protect your home. Unfortunately, the device lacks support for direct, third-party device integrations, but IFTTT recipes are available, allowing you to perform simple tasks like changing light bulb colors or sending out an SMS text when a leak is detected. Investing $80 in protecting your home with the Lyric is a no-brainer. Sure, it’s an investment in a device you’ll set and forget, but should disaster strike, it’s much cheaper than dealing with a flood.